“Jannis Kounellis”, curated by Germano Celant, is the major retrospective dedicated to the artist following his death in 2017. Developed in collaboration with Archivio Kounellis, the project brings together more 60 works from 1959 to 2015, from both Italian and international museums , as well as from important private collections both in Italy and abroad. The show explores the artistic and exhibition history of Jannis Kounellis (Piraeus 1936 – Rome 2017), establishing a dialogue between his works and the eighteenth-century spaces of Ca’ Corner della Regina. The artist’s early works, originally exhibited between 1960 and 1966, deal with urban language. These paintings reproduce actual writings and signs from the streets of Rome. Later on, the artist transferred black letters, arrows and numbers onto white canvases, paper or other surfaces, in a language deconstruction that expresses a fragmentation of the real. From 1964 onward, Kounellis addressed subjects taken from nature, from sunsets to roses. In 1967 Kounellis’ investigation turned more radical, embracing concrete and natural elements including birds, soil, cacti, wool, coal, cotton, and fire. Kounellis moved from a written and pictorial language to a physical and environmental one. Thus the use of organic and inorganic entities transformed his practice into corporeal experience, conceived as a sensorial transmission. In particular, the artist explored the sound dimension through which a painting is translated into sheet music to play or dance to. Already in 1960, Kounellis began chanting his letters on canvas, and in 1970 the artist included the presence of a musician or a dancer. An investigation into the olfactory, which began in 1969 with coffee, continued through the 1980s with elements like grappa, in order to escape the illusory limits of the painting and join with the virtual chaos of reality. In the installations realized toward the end of the 1960s, the artist sets up a dialectic battle between the lightness, instability and temporal nature connected with the fragility of the organic element and the heaviness, permanence, artificiality and rigidity of industrial structures, represented by modular surfaces in gray-painted metal. Kounellis participated in exhibitions that paved the way to Arte Povera, which in turn translated into an authentic form of visual expression. An approach that recalls ancient culture, interpreted according to a contemporary spirit, in contrast with the loss of historical and social identity that took place during the postwar period. Beginning in 1967, the year of the so-called “fire daisy,” the phenomenon of combustion began to appear frequently in the artist’s work: a “fire writing” that enlights the transformative and regenerative potential of flames. At the height of the mutation, according to alchemical tradition, we find gold, employed by the artist in multiple ways. In the installation Untitled (Tragedia civile) (1975), the contrast between the gold leaf that covers a bare wall and the black clothing hanging on a coat hanger underlines the dramatic nature of a scene that alludes to a personal and historical crisis. In Kounellis’ work smoke, naturally connected with fire, functions both as a residual of a pictorial process, and as proof of the passage of time. The traces of soot on stones, canvases and walls that characterize some of his works from 1979 and 1980 indicate a personal “return to painting,” in opposition to the anti-ideological and hedonistic approach employed in a large part of the painting production in the 1980s. Throughout his artistic research Kounellis develops a tragic and personal relationship with culture and history, avoiding a refined and reverential attitude. He would eventually represent the past with an incomplete collection of fragments of classical statues, as in the work from 1974. Meanwhile, in other works the Greco-Roman heritage is explored through the mask, as in the 1973 installation made up of a wooden frame on which plaster casts of faces are placed. The door is another symbol of the artist’s intolerance for the dynamics of his present. The passageways between rooms are closed up with stones, wood, sewing machines and iron reinforcing bars, making several spaces inaccessible in order to emphasize their unknown, metaphysical and surreal dimension. The exhibition narrative is completed with large-scale installations realized by Kounellis from the end of the 1980s. These ensembles envelop shelves or metal constructions containing objects of various origins: from musical instruments to sacks, from plaster casts to stones, from coats to glasses, from mechanical gears to fragments of furniture. The large interventions hosted in the central rooms of the two main floors of Ca’ Corner della Regina are included in this context. 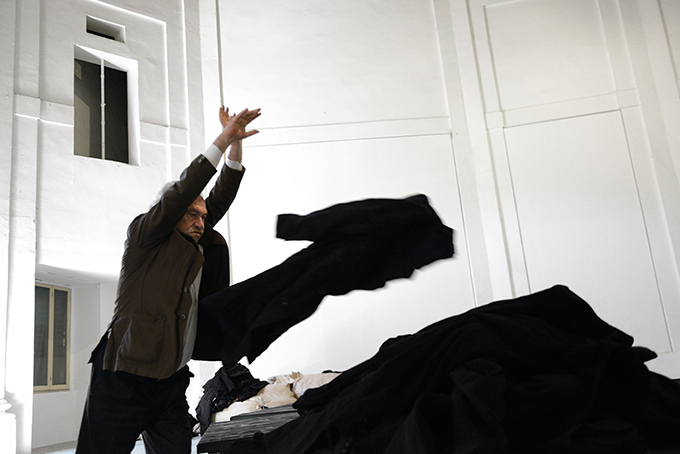 Already as early as 1967 Kounellis dealt with the motifs of gravity and equilibrium in his works. However, it wasn’t until the 1980s and 1990s that he developed a deeper dialogue with architectural and urban spaces. Both of these aspects would result in the monumental 1992’s installation presented in the internal courtyard of the Venetian palazzo. Originally conceived for the external façade of a building in Barcelona, it is composed of seven metal plates that support sacks filled with coffee beans. The retrospective is completed on the ground floor by documents – including films, exhibition catalogues, invitations, posters and archival photographs – that trace Kounellis’ exhibition history, and by a focus on his theater projects. The exhibition is accompanied by a volume that includes an essay by Germano Celant and an extensive illustrated chronology, documenting and exploring Jannis Kounellis’ artistic career and biography. Designed by 2×4 (New York), the book is published by Fondazione Prada.